Never before seen on Youtube! Deadblow and Bad Attitude square off in the Battlebots Season 2 Middleweight Quarter-Finals. It’s possible he’s refering to 9 year old Gus Steyer but he wasn’t driving during this fight. If the fight had? gone the distance, I’d say it would’ve been 39-6 in favor of Bad Attitude. This, and Thomas Petruccelli was? hardly a kid. The Pulverizor can deal damage but that’s not where Deadblow got stuck. Deadblow got stuck near the Pulverizor at two sections of the Spike Strip and it’s partially Grant’s fault as all the while Bad Attitude was keeping Deadblow near there, Deadblow was firing its weapon. If? he hadn’t the fight probably would’ve gone the distance. Bad Attitude still likely would’ve won the fight though. Yeah… So Grant lost because his robot got stuck on a hammer mechanism that has nothing to do there since it’s empty (3:52) and does ZERO damage (5:09)? What a joke! Grant was obviously much more agressive and accurate with his attacks during the whole fight.? That young kid did all. Grant Imahara and Bill Nye sitting? at the same table. Wow. *1:09 Jamie from Myth Busters! O.o? only? one thing to say. No, thumbs down because most of us here more than likely? 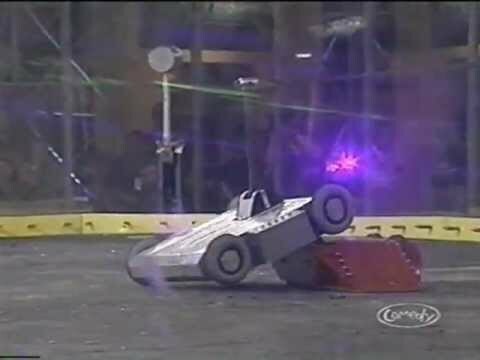 knew them when thier show came out FROM battlebots. Bill Nye the science guy!? FTW! If you have to ask me who that is you didn’t have a childhood. Was Bill Nye insinuating that Grant Imahara was the? equivalent of Captain Kirk? so this is how Grant? and Jamie met…..
bill nye talking? to grant? yea! yeah it’s such? more fun 😀 !!! Absolutely, this is exactly why Robot Wars UK introduced the rule that all robots must have an active weapon. The only problem was that it meant axlebots couldn’t compete? anymore.